Imaginary Sunshine » There’s no use crying over spilt coffee – unless you’re me. There’s no use crying over spilt coffee – unless you’re me. My aunt and uncle left today (my other aunt is still here for a bit longer!) and the day started off well – I woke up at my usual time to go to work, said my good byes and then left for work. I get home and after dinner, I had to take all the pillowcases and sheets from my bed that they used to be washed (and to put my own sheets back on). Anyone who knows me knows that I’m not a coffee drinker. So imagine my disgust when I walked into my bedroom to smell the very obvious scent of coffee in my room. One of them, I don’t really care which at the moment, spilled coffee. I just finished scrubbing my white desk to get the stain out. It was on the top of my desk, and got onto one of my desk drawers and a small patch of carpet near my desk (which is thankfully brown!) got coffee on it as well. My room still smells of coffee, even after all the cleaning products and successful stain removal (of my desk). Oh, one of them also spilled coffee stuff (erm, probably instant coffee mix or something? It’s very powdery!) onto my bed. Well, it’s on the sheets that are now getting washed, but they had to get vacuumed up first because there was just so much of it everywhere. It was right under where their pillows should have been, so I don’t know how they managed that either. So annoyed. It was great having them, I hadn’t seen them in years, probably about 16 years now, but that does not excuse the fact that they spilt coffee in my room and didn’t clean it up, or the fact that they spilt coffee powder stuff onto the bed and didn’t clean that up either! In happier news… I finally got my earrings out! To the left is the offending pair. I had issues with this pair before because of the backs that they came with. This was the pair that I started off with, when I got my ears pierced in 2008. They have a deeper ‘notch’ in the post than any other pair of earrings that I own. I decided (stupidly…?) to try wearing them with plastic/rubber earring backings. Big mistake. It worked out great for a short while, and then the one time that I left them in for a few days without taking them off… I had trouble taking them off again. The backings were just stuck. I managed to get both off tonight, after weeks of trying to get them off. I kept on trying to pull the back off, so instead tonight (while rewatching the season finale of Grey’s Anatomy…) I was just yanking on the actual earring itself as hard as I could (without hurting myself, for the most part) and then pop, and the right one came out. So I repeated the process and then put the new pair in. To the right is the new pair that I’m currently wearing (the non-offending pair). My mom gave them to me, she got them when she went on a cruise to Alaska (they give out a lot of swag for cruise-goers, there was also another pair that she gave me). Hopefully this pair of earrings comes out easier than the last two pairs! 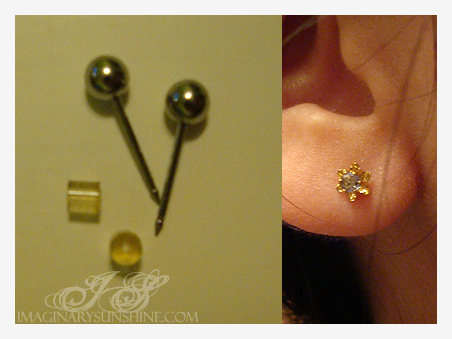 I’m surprised you haven’t completely given up on stud earrings and switched to earrings that don’t require backings. Oh, the new pair comes out like a dream. 😀 My mom wants me to wear the other pair that she got me, but it’s pearls and they look huge in my ears, lol. I have my ears pierced (and have had them pierced multiple times over the years), but I hardly ever wear earrings (its been over a year since I last wore any). Good luck with everything! I know how much of a hassle it can be! They did *not* tell anyone about the spilled coffee. They removed the cup that they had, but didn’t tell anyone about it and had just left it there. Because it was still damp (my carpet… grrr), I’m guess it was from this morning before they left. They could have had the decency to TELL someone about it, my desk was a brown tinge (but now it’s white again, but that’s not the point, lol).